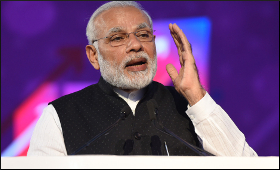 Prime Minister Narendra Modi will dedicate to the nation the newly constructed Multi Modal Terminal on River Ganga at Varanasi on Monday, November, 12. The Jal Marg Vikas Project (JMVP) is being implemented on the Haldia-Varanasi stretch of National Waterway-1 (NW-1) with the technical assistance and investment support of the World Bank, at an estimated cost of Rs. 5,369.18 crores (USD 800 million, of which USD 375 is IBRD loan) on a 50:50 sharing basis between Government of India and the World Bank. The project entails construction of 3 multimodal terminals (Varanasi, Sahibganj and Haldia); 2 intermodal terminals; 5 Roll On – Roll Off (Ro-Ro) terminal pairs; new navigation lock at Farakka; assured depth dredging; integrated vessel repair & maintenance facility, Differential Global Positioning System (DGPS), River Information System (RIS), river training & river conservancy works. Prime Minister will also receive India’s first container vessel that sailed from Kolkata on 30th October 2018, carrying cargo belonging to PEPSICO (India) from Kolkata to Varanasi.